Kids’ Life Bible Clubs (formerly Christian Service Club, Inc.) got its start in 1962, growing out of a desire to reach inner city children beyond the two weeks of summer Vacation Bible School at Sherman Street Christian Reformed Church. Many people were concerned about race relations in those volatile times and saw this as a way to present the gospel in a neutral environment, the public schools, and to promote mutual understanding. 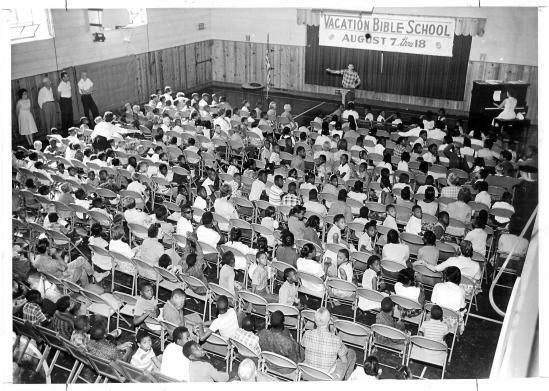 It was initially named Community Bible Clubs at the suggestion of the Assistant Superintendent of Grand Rapids Schools, Dr. Pylman, who supported the idea of having the clubs in the schools. That first fall clubs were started in three schools: Sheldon, Henry and Sigsbee. On the day before the start of each club, Henry Nieboer, chairman of the board of directors of Christian Service Club, went to each classroom of each school and announced that there would be a Bible Club starting the next day and handed out registration forms. The first club was at Sheldon School. Two teachers, Mrs. Kooi and Miss Felton, were prepared with materials and a filmstrip of the Bible story. Mr. Nieboer and Mr. Bill Narvis were also there to see how things went. No one knew how many kids to expect. The leaders were stunned to have whole classes led by their teachers arrive for Bible Club – about 200 children! They had to quickly divide the children up and take them to three additional rooms. The Henry School club was the next day, but this time they arranged to use the gymnasium to accommodate another large group of children. Sigsbee was a repetition of the numbers at Henry. Three more clubs were added that school year at Madison, Vanderberg and Franklin schools and attendance doubled. What an affirmation that God had directed and blessed the beginnings of this organization. The office of Christian Service Club (CSC), sponsor of the Bible club program, was moved from a room in a church to a new, larger location on Sheldon Ave. where they installed their first phone and had room for volunteers to come and help with office work. Marty Hamstra, a seminarian, was hired as part-time office and program manager. The program began to grow and clubs were opened in more schools. Even then, many people were amazed that the Bible could be taught in public school buildings. Rev. James Kiefer and his wife Velma came to the attention of the CSC board. They had served with Child Evangelism Fellowship for 12 years where they taught children’s Bible classes. Mrs. Kiefer introduced the board to the use of the flannel graph impressing them with this personal, “high class” method of teaching Bible stories that generated interest through the movement of the story scenes and characters. The board hired her to instruct the Bible Club teachers in the use the of the flannel graph and it proved, as our teachers can attest today, to be very appealing to the children. The success of the first year of Community Bible Clubs in the schools and the engaging nature of the flannel graph method prompted some men on the board to wonder if CSC could extend its outreach into the community by producing a television program using the flannel graph to present Bible stories. Henry Nieboer approached a new station in town, WZZM, with the idea and they expressed interest in such a program. At the end of the second year of Community Bible Clubs, the first 15 minute program, Stories of the King, featuring Velma Keifer teaching Bible stories with the flannel graph was on the air Sunday mornings at 11:00 am. The number of schools with Bible clubs continued to grow and the Keifers managed both the clubs and the TV program. The program format was extended to 30 minutes when song leader, Ray Felton, joined organist, Harold Hartger, and a special craft project was added. Many children who watched the program sent letters to the station expressing their love for the Lord and how much they enjoyed Miss Velma and Mr. Ray. The program was reaching 10,000 homes at the time and the CSC board was thrilled with the results. However, mounting expenses involved with producing a television show forced the board to transfer responsibility for the TV program to another group, the Christian Laymen’s League. This move allowed CSC to concentrate on the Bible clubs in the public schools, which are our legacy and privilege to carry on today. You may donate any amount securely using your credit card or PayPal account.